We have been faithfully serving the Southlake/Keller area since 2006 in various forms of fence repair, staining and construction. Our mission is to provide you with quality work at an affordable rate with a product that outlasts what other companies offer you. We are ready to go the extra mile in order to achieve the vision and goals of our customers. 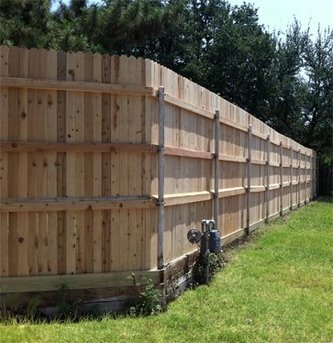 DFW Fence Pros is committed to ensure that you, the homeowner, receive the professional results you deserve. Whether it is a simple replacement of a few boards, a post, an entire fence, deck or arbor from start to finish our hearts and professionalism shine through. What is a dog-run fence? A dog-run fence is simply a type of fence where a dog can see out but people cannot see in. A standard set-up for this type of construction project is steel posts;alternating 2x2s and 1x8s, with 1-inch gaps between boards. Sun control: Fences and screens can be designed to admit full sunlight, provide partial shade, or admit no sun at all on their shady sides. Wind control is another popular consideration for homeowners in the mid cities and Fort Worth area and we can assist you every step of the way.